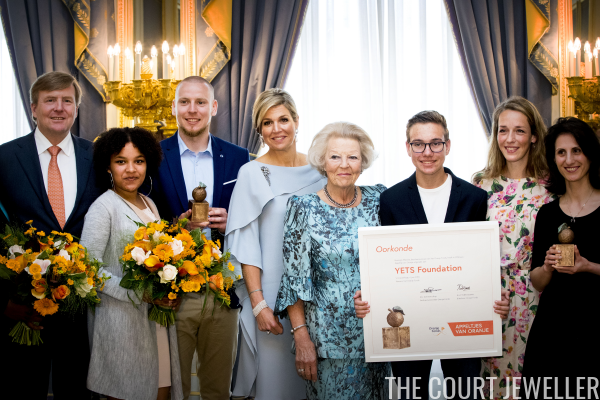 King Willem-Alexander, Queen Maxima, and Princess Beatrix of the Netherlands were on hand in The Hague on Wednesday at an awards ceremony for the Appeltjes van Oranje program, part of the Oranje Foundation. 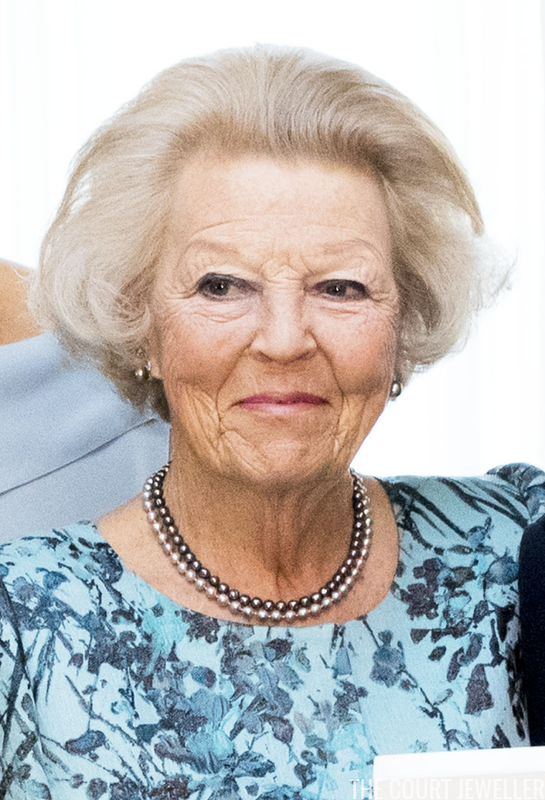 Both Queen Maxima and Princess Beatrix chose pearls for the occasion. Here's a look at Beatrix's two-toned pearl necklace and pearl earrings. She paired the necklace with a pearl-tipped bangle. You also get a glimpse here of her diamond engagement ring. Queen Maxima went for major jewels for the occasion, including one of the family's large diamond brooches. 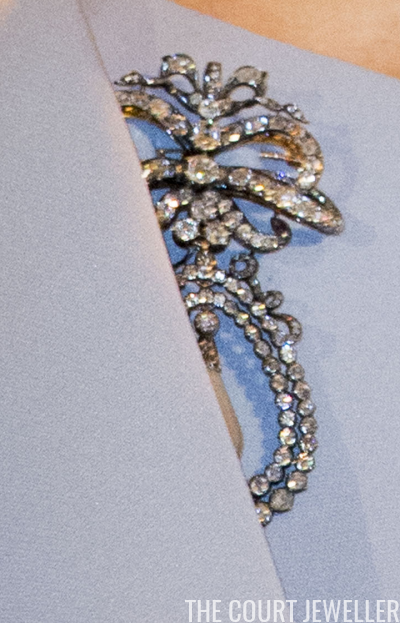 The fabric of her dress covers the large pendant portion of the brooch in many photos, but here you can see that a single pear-shaped drop pearl is suspended within a double frame of diamonds. Here's a closer look at the intricate top portion of the brooch. Maxima often wears this piece with different pendants. Maxima wore the brooch with her large pearl and diamond earrings, which feature a button-style stud made of a large pearl set in a cluster of diamonds and a pear-shaped drop. As she presented one award, we got a good look at Maxima's bracelets and rings. 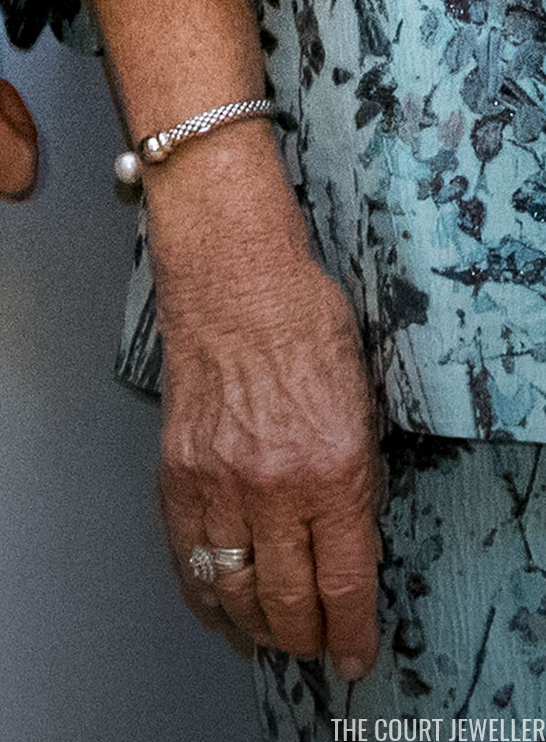 On her right hand, she wore a large diamond and pearl ring. Her right wrist adornments included an eight-stranded pearl bracelet with a diamond clasp. 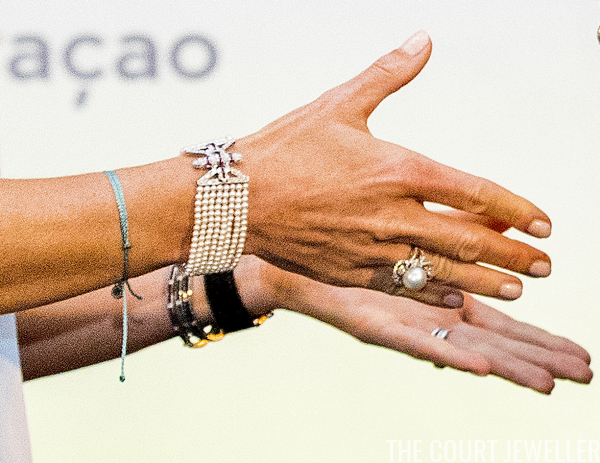 On her left wrist, you can spot a trio of her tennis-style bracelets, set with diamonds, sapphires, and rubies. Here's a look at Maxima's entire ensemble for the awards ceremony.